Palpable fear and anxiety gripped residents of Sokoto State as some Arewa youths on rampage, attacked Igbo traders in the state on Sunday. According to reliable reports from our sources, the incident, which visibly shook Igbo merchants on Bello Way and Emir Yahaya areas of Sokoto metropolis, forced other Igbo traders at nearby Sahara street to close down their shops and run for safety. Biafra Writers, learnt that heavily armed Arewa youths, in their hundreds, set ablaze a building along Bello Way, where Igbo traders have shops. One of the victims, identified as Chief Okafor, said, “My house was razed by some suspected arsonists. Another victim, William Emmanuel Usoh, told journalists that his Honda Civic car was vandalized by some rampaging youths along Emir Yahaya Road. Usoh further explained that, but for the timely intervention of men of the Nigeria Civil Defence and Security Corps, the youths would have destroyed more valued properties in the area. 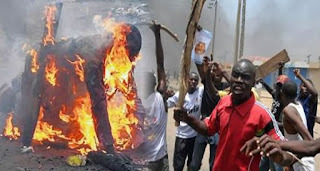 When contacted, the President-General of Igbo Community in Sokoto State, Charles Uwaga, confirmed the incident. He said reports reaching him indicated that some of his members were attacked within the state capital. “A member just called me that his house was razed. There were also cases of vandalised shops,” Uwaga said. It was noted that these acts might not be unconnected by the desire of some Arewa youths to avenge the Biafra agitators in the Eastern region following threats to evict Igbos from their region come October 1. OPERATION PYTHON DANCE WHERE ARE YOU? LAI LAI MOHAMMED, ABDULLAHI ANGO, SULTAN, & ALL THE FORCES FROM ZOO WHERE ARE YOU? THE EYE IS WATCHING ALL YOUR WICKEDNESS & HYPOCRICIES AGAINST THE PEACEFUL IGBO NATION! What are they still doing in Northern Nigeria? Onye Ugbo gburu obu ntia gburu ya.